Please refer to our stock # 1083 when inquiring. Globular ribbed body with a shaped neck and handle. 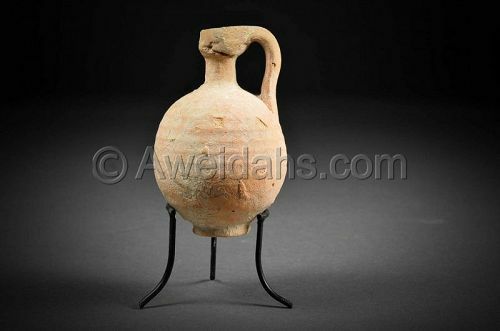 Antiquities are valuable because of their historical and cultural values and especially because of their provenance in the biblical lands during the biblical period. To own a “biblical” artifact is to possess a genuine, one-of-a-kind, object that puts one in actual physical contact with the world of the Bible. These unique items may be displayed as a testimony to biblical history as well as beautiful pieces of art and culture.